Alabama, Florida, Georgia, Missouri, North Carolina, South Carolina, Tennessee, Texas, and Virginia. The 2016 Atlanta Super Regional was held Oct. 29 at the Georgia Dome. Tarpon Springs was named super regional champion, but faced some stiff competition from Wando and Dobyns-Bennett. Tarpon Springs has consistently won the Atlanta Super Regional except when Broken Arrow attended in 2013. However, this year, the group's dominance in the Southeast faced a few cracks when Wando won the visual caption and DB won the music caption. Tarpon continues to perform well on the national stage, but we're starting to see some other Southeastern programs join them on that level. With all of these top three finishers competing at the Grand National Championships in just two weeks, there's a good chance we'll see three Southeastern finalists. Park Vista was incredible. 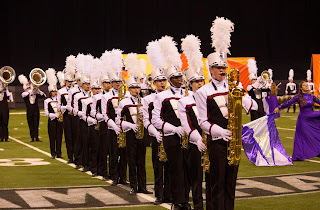 Their last BOA appearance earned 14th place at Atlanta in 2014, but the performances they brought this year were certainly worthy of their top-half finish. Harrison stayed close behind Park Vista, earning fifth place in finals. Walton rounded out the top half. This year's Atlanta Super Regional will feature a strong divide between the top half and bottom half. On the top end we have many excellent returning groups and a couple of new groups that will compete for a medalist position. But we're missing most of the groups that fill up the middle of the pack, the ones that are solidly in finals, but not in the top half. Instead, the bottom half of this year will give many bands the chance to make finals at a Super Regional, a chance many bands wouldn't otherwise have. Tarpon Springs really has no competition in Atlanta. Aside from when Broken Arrow attended in 2013, no band in this region can come anywhere close to their level. This year, Tarpon will be returning to Grand Nationals, so don't expect to see a completely finished product. They'll still have two more weeks to perfect the show before heading to Indianapolis in November. While most other super regionals will find the toughest competition taking place in class AAAA, the steadily increasing number of competitive AAA bands in the Southeast, means we might not even see a single AAAA band in the top half of finals. Three of these four groups are heading to Grand Nats this year for what will be the ultimate AAA showdown with two strong Texas groups and a powerful Indiana group (or two) also looking to win the class. Dobyns-Bennett won the Winston-Salem Regional earlier this year. It's the school's fourth consecutive champion title, and it's only one sign of the level of excellence DB is able to retain year after year. This year's show takes a little bit of a different approach than past years, but it might be just what they needs to become the second Tennessee band to make Grand National finals. at Lucas Oil Stadium. // Photo by Tom White. Franklin placed second behind Castle at the Clarksville Regional, but has recently developed a pattern of slowly but steadily refining the show until the very last minute. While they might have an ending to the show this weekend, don't expect it to be the same ending as you'll see in Indianapolis. Harrison is a consistent Grand National finalist who has continued to display that success on a local level. Earlier this season they won the Powder Springs Regional and without a trip to Indianapolis, this is essentially the end of their marching season. Expect an elegant performance that is much more of a final product than any of their other class challengers. James F. Byrnes has had limited participation in BOA events the past few years, but is making a huge push this year as they take on Grand Nats in November. This year's show has already earned second place at Winston-Salem, and the band will certainly be looking to catch, if not pass, Winston-Salem Champion Dobyns-Bennett. These two groups have quite impressive resumes, including multiple Grand National finals appearances. However, for various reasons, both groups have recently not been performing at quite the same level they've previously attained. That could change this weekend. Jacksonville State University // Photo by Claire Albrecht. Kennesaw Mountain has typically competed at Grand Nats every two years, but they will not be returning this year. Instead, they focused their efforts on competing at many more local and regional events, with less success than would normally be expected. At Powder Springs, they earned ninth place, but in two weeks they were able to improve enough to earn second place at Jacksonville. If they've been able to continue at that trajectory all season, we have no reason to worry and should expect a top finish here in Atlanta. Wando faced some severe setbacks last year because of flooding caused by Hurricane Joaquin, but this year, we expect them to return to their usual high placements. At least, that means moving back into the top half. At most, it could earn them a medal. This year, there is huge group of bands who have the potential to grab one of the five remaining finalist positions. Some of these groups have had huge success at early season regionals, and some of them missed finals early season, but could still make finals here. Walton sits at the top of the bubble, having been safely in finals the past two years. And with few other strong competitors, they shouldn't face too much trouble staying in. East Coweta has made some drastic swings, placing as high as second at the 2015 Jacksonville Regional before missing out on finals at Atlanta later that same year. This could certainly be the year they turn their early season success into a finals position at Atlanta. Hillgrove sits just behind Walton in a position that will almost certainly earn them a spot in finals. Last year, they were the first group out of finals, but most of the groups who beat them aren't returning. Lambert was extremely successful at regional events in 2015 and earlier this season, so a push into finals is very possible and in some ways can almost be expected. Park Vista last attended the Atlanta Super Regional in 2014, when they received 14th place. This year, it should be pretty easy for them to move into finals. Fred J. Page and Siegel both were just out of finals at Clarksville earlier this year, placing 13th and 10th, respectively. While on an ordinary year, missing finals at a regional would be a sign that you would certainly miss finals at a super regional, this isn't an ordinary year. Jackson County, McEachern, Mill Creek, and Milton all beat Kennesaw Mountain at the Powder Springs Regional. While this doesn't guarantee them a spot in finals. And in all honesty, most of them will probably not earn a spot, beating a group like Kennesaw at any point in the season is a pretty big accomplishment. Sherman is from Texas, and we made the mistake of betting against Texas groups at Atlanta last year. Their most recent BOA appearance earned them 29th place at San Antonio, so making finals here is definitely within the realm of possibility. Squeezing all 35 preliminary performances into Saturday morning means it's going to be a very long day at the Georgia Dome. This will be the last BOA marching championship held in the Dome, and we wouldn't want to celebrate it with anything less than the most exciting and fast-paced event all season. Music: John Alstrin, Marty Griffin, Gifford Howarth, and Chuck Naffier. Visual: Marie Czapinski, Kyle Miller, and Neal Smith. Franklin usually goes to the Indy Super Regional, but since Indy is the week before Grand Nats, it makes sense that they would sign up for an earlier Super Regional. Do you think if the Indy regional remains the week before nationals in upcoming years that Franklin could be an Atlanta super regional regular? Y no Mason or Harrison? Only four returning finalists. Very strange to see no Mason and Harrison. I believe Harrison will sign up later but I'm not sure. Fort Mill apparently has some schedule conflict. Fort Mill football plays at Nation Ford on October 28th. Blue Springs was on this list. What happened? They will be going to the Indianapolis Super Regional instead. Watch for Wando! Sleeper of the year for 2016! Flood of 1000 years last year 2015 in SC cut practice time in half. But 60 seated for all-state band in Jan. More than 3 times next band. Hoover beat Hillgrove at the Jacksonville Contest of Champions. Why would they not even be considered in the bubble? Hoover actually won the Contest Of Champions at Jacksonville, granted they won by a very small margins within the points (By like decimal numbers), why would that contest not go into account. I agree...I think Hillgrove is definitely ranked too high. I see them just sneaking into finals in 11th or 12th if anything. Also with the knowledge of Contest of Champions, that also affects other groups as well. Using the same logic we should be taking a closer look at River Ridge as they beat Hoover by large margins at BOA Jacksonville State, taking 4th (less than a point behind EC and K Mountain) while Hoover took 10th. Honestly I was suprised not to see them (River Ridge) in the prediction list; saw their show and it was quite impressive. I agree that River Ridge certainly had an impressive showing at Jacksonville, but Hoover's placement in prelims was much closer to that of River Ridge, getting third in GE. Their finals placement could most likely be attributed to a much worse run than their prelims. Contest of Champions shouldn't be considered as a failure to Hillgrove, but should reflect and undeniable improvement by Hoover after an extremely disappointing finals placement at Jacksonville. I further agree that Hillgrove is ranked rather high, but Hoover's victory should be more reflected in Hillgrove's predicted placement and by extension Hoovers. Totally agree. I definitely think that Hoover and River Ridge are two potential upset bands for sure. This is River Ridge's first attempt at a Super Regional, so we don't have a lot to go on. Both of them deserve some mention as possible finalists. Just saying, Kennesaw and Jackson County didn't deserve to be in finals. They were extremely dirty visually and their scores should've been a lot lower. It is crazy to me that McEachern placed so low. They outplayed and out designed at least three of the finalist bands. I am not sure why, but this is the 2nd year they have scored lower than they deserved. DB Music is crazy good! I agree! What a sound!